This photo-shopped image shown at last night's Limerick Supervisors meeting appears to show members of the board in a bus shelter. 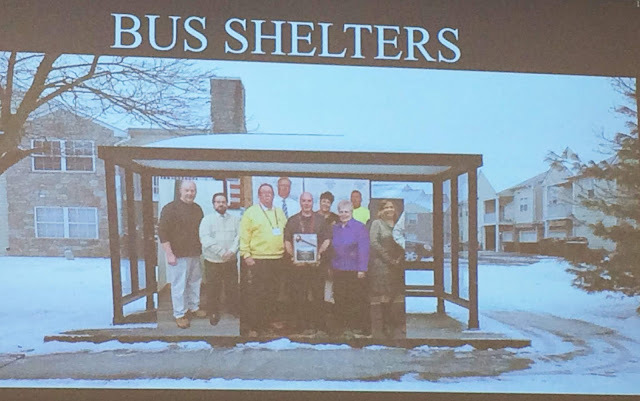 But while the photo may be faked, votes taken last night would indicate the supervisors interest in building more bus shelters for residents is genuine. Last night's Limerick Board of Supervisors meeting was fairly brief -- 45 minutes -- but there were several items worth noting. One is the township's pursuit of more bus shelters for an increasing number of riders of the SEPTA bus system. Specifically, the township is looking to build one on Ridge Pike, west of the intersection with Township Line Road near the Walgreen's Pharmacy. 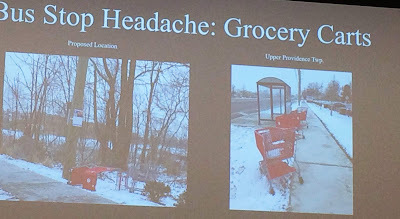 Many people use that bus stop and SEPTA will not build one or take responsibility for one being built, Tim Haas, assistant to the township manager, told the supervisors. This is the basic model the township supervisors preferred. A local business has volunteer to donate $5,000 toward getting a new shelter built there, so the board took a look at its options. The one they settled upon has a partial enclosure to protect riders from the elements while they wait, as well as space for a wheelchair and a bench. 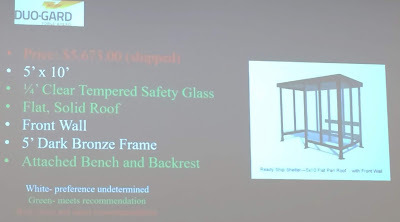 Supervisor Patrick Maroney said he would like to see something other than flat roof, so the snow does not sit on the top of the shelter, and Supervisor Thomas Neafcy said he does not want to see any advertising on the shelters. Neafcy also said there are four or five locations in the township where shelters are needed. "The township is at the point where shelters are needed as many residents use public transportation," said Neafcy. "The time has come." The supervisors, who were told by Township Manager Dan Kerr that the township will have both maintenance and liability responsibilities for the shelters, said they will consider building more depending on how the current project goes. If they do, they may have to deal with shopping carts piling up at the shelters, as currently happens at some of the shelters that already exist. Haas said the administration proposes a policy of calling the stores and telling them to pick up their carts, or they will be thrown away. In the wake of last month's approval of the preliminary approval of the controversial TP Trailers and Truck Equipment plan to build a manufacturing and service facility on 10 acres at 181 Limerick Center Road, there was some follow up. The preliminary site plan for TP Trailers. Kerr told the supervisors that the administration is working on some ordinance changes which would prevent the approval of the stacking of cargo containers three high, as is possible under the TP Trailers Plan and which, due to the ordinance language, the township was powerless to prevent. Resident Amy Walker, an opponent of the plan, provided the township with a generic ordinance on the matter put together by a state-wide local government association. The supervisors were also asked about possible discharge of pollutants into local streams and Supervisors Chairman Ken Sperring said both the federal Environmental protection Agency and Pennsylvania Department of Environmental protection conduct unannounced inspections. "I'm very familiar with them because they are in my facility all the time," said Sperring, who is the owner of Limerick Collision Center. Kedrr also said that the township is required to inspect "every outfall" of the stormwater system under new federal clean water rules. He promised to give a presentation on that process at a future board meeting. The supervisors also informed Walker that signs barring truck traffic for nearby West Cherry Lane only await permission from PennDOT before they will be erected. 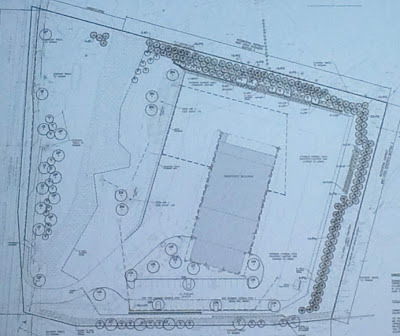 The supervisors also voted unanimously Monday night to pay off the $3.3 million remaining on the loan taken out by the Limerick Fire Company to build a new fire station near the intersection with Ridge and Swamp pikes. Kerr said the firehouse is owned by the fire company but, under an agreement approved last night by the supervisors, should Limerick Fire Company ever cease to provide fire protection in the township, ownership of the building would revert to the township. In 2018, the Limerick and Linfield fire companies completed a merger into a single entity that now calls itself the Limerick Fire Department. The money for paying off the loan came from the proceeds of the August sale of the township's sewer system to Aqua PA for $75 million. As a result of the sale, the supervisors decided to make the township debt free. And with that, here are the Tweets from the meeting, what few there are.